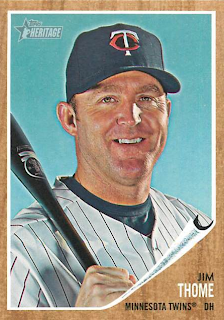 The 600 Home Run Club just welcomed it’s eight member, Jim Thome. Second only to Babe Ruth for least amount of at-bats needed to reach the milestone, Thome hit two opposite field home runs tonight, number 599 and 600. Thome needs 10 more home runs to surpass Sammy Sosa for seventh place on the All Time Home Run list. Thome entered the 600 Home Run Club with little fanfare and certainly without the media blitz given to Alex Rodriguez earlier in the year. While he deserves more, it is fitting that this milestone came quietly, as most of his accomplishments have been without bravado both on and off the field. A charitable man, Thome is known for his kindness. It will be a while before we see another player join the 600 Home Run Club. At this point only Albert Pujols, Mark Teixeira and Miguel Cabrera have a decent shot at reaching 600. Pujols has 437 over 11 seasons at age 31, Teixeira has 307 over 9 seasons at age 31, and Cabrera has 270 over 9 seasons at age 28. Adam Dunn was on pace tat the beginning of the season. If he can get his career back on track, he might still have a shot at it. Congratulations to Jim Thome. Next stop... Cooperstown. Who are the 2011 Topps Gypsy Queens?